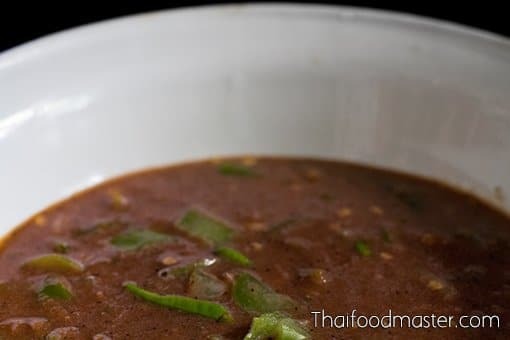 Naam phrik lohng reuua (น้ำพริกลงเรือ) – Literally translated as “boat embarking chili relish”, this particular boat seems to have drifted a long way from port and these days, the actual dish served in Thai restaurants is far away from the original version. We want to tell you the real story behind this dish and to present you with the original version’s recipe in its true character – as if the boat is still moored at the dock. Naam phrik lohng reuua is a relish that was created with ordinary ingredients for a real princess. It is made by frying sour-sweet and salty fermented shrimp paste chili sauce (nam prhrik kapi) together with a salty-sweet pork condiment (muu waan), and adding deep-fried crispy and fluffy fish meat for body and crunch. The resulting taste should be sour-salty and sweet, without any of these flavors taking the lead. They should all be equally present, as a melody that plays harmoniously on the palate. The dish is served alongside raw, salted duck egg yolk balls, pickled garlic and vegetables such as apple eggplants, cucumbers and winged beans, as well as white turmeric and fresh coriander leaves. 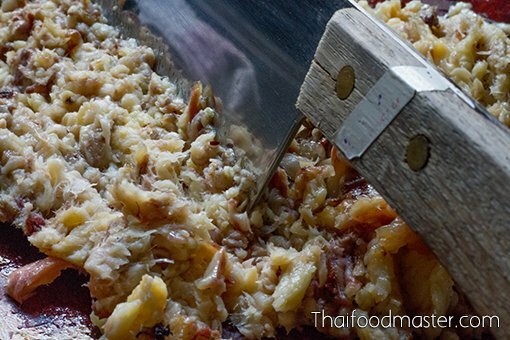 We follow the recipe of Maawm Luaang Neuuang Ninrat (หม่อมหลวงเนื่อง นิลรัตน์), a former chef at the residence of Phra Wimaadaa Thuuhr. 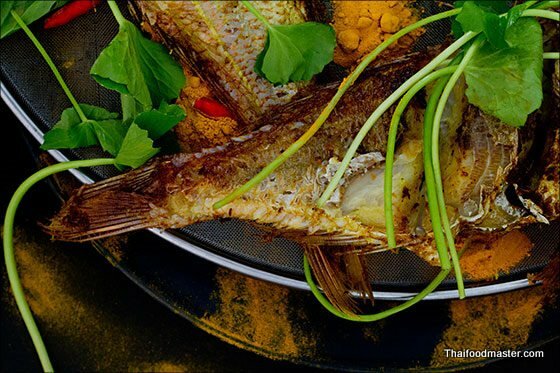 Throughout her life, she prepared, taught and wrote on the intricacies of Thai Royal cuisine. We find it this to be the recipe closest to the original, but we couldn’t help ourselves from modifying it just a bit. We cooked another version with thinly sliced hairy-fruited eggplant. 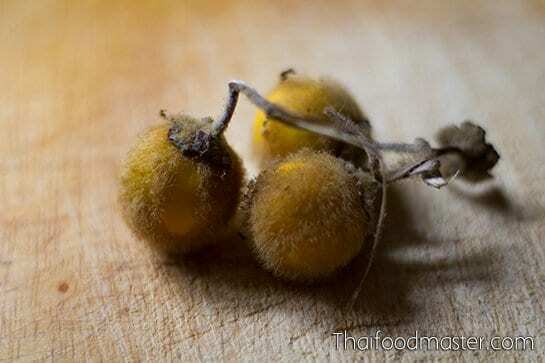 (maeuk – มะอึก; Solanum ferox). Both versions were heavenly and flavorful. 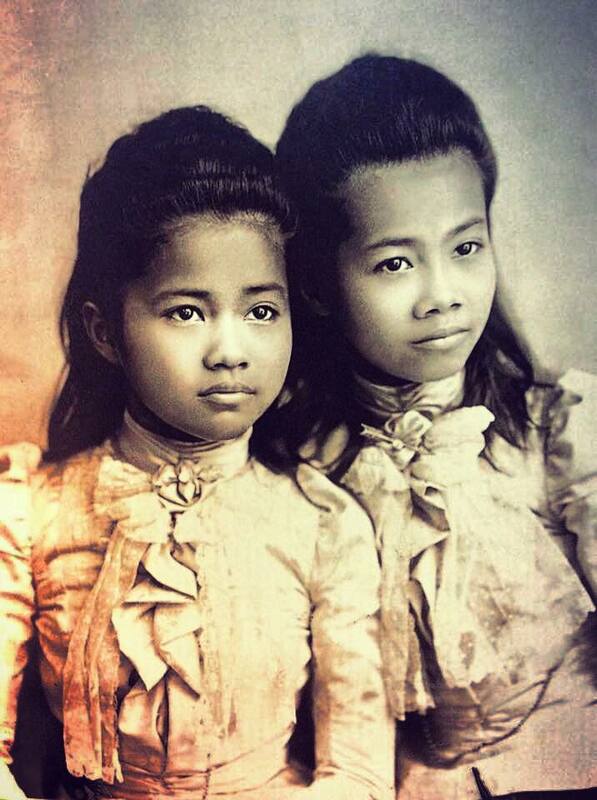 The story told is that one day at Suan Sunantha Palace in Bangkok, two sister princesses – Sohmdet Ying Naawy (สมเด็จหญิงน้อย) and Sohmdet Ying Glaang (สมเด็จหญิงกลาง) – the daughters of King Rama V and Phra Wimaadaa Thuuhr (พระธิดาของพระวิมาดาเธอฯ) – were boating along a canal within the palace compound. The princesses decided to dine aboard the boat. It is said that M.R. 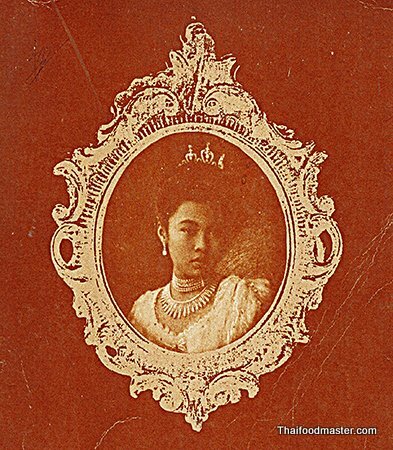 Sadap Ladawan (เจ้าจอมหม่อมราชวงศ์สดับลดาวัลย์), one of the last concubines of King Rama V, went into the royal kitchen to prepare food for their onboard picnic. In the kitchen pantry, M.R. Sadap Ladawan found leftovers of fermented shrimp paste dipping sauce (nam prik kapi), sweet pork condiment (muu waan) and fluffy, crispy fried snakehead fish meat. M.R. 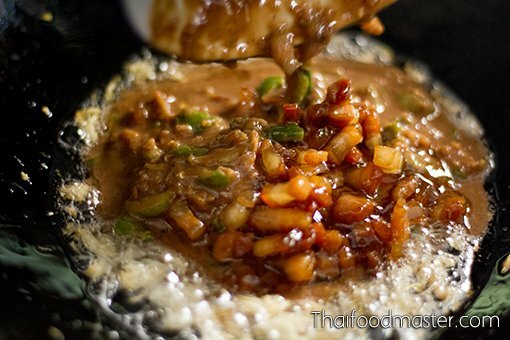 Sadap Ladawan mixed and fried in pork fat the fermented shrimp paste dipping sauce together with the sweet pork condiment. To this, she then added the deep-fried crispy and fluffy snakehead fish, peeled pickled garlic and shaped small balls from raw salted egg yolks. She served this dish, accompanied with fresh vegetables, to the princesses. The result was so surprisingly delicious and flavorful that it soon became a popular dipping sauce, and an ideal menu item for serving large numbers of guests. These days, the modern version of this dish tends to fall on the sweeter side of the spectrum; sometimes pea eggplants are added, and the dish is usually presented and served in elaborately carved vegetables. 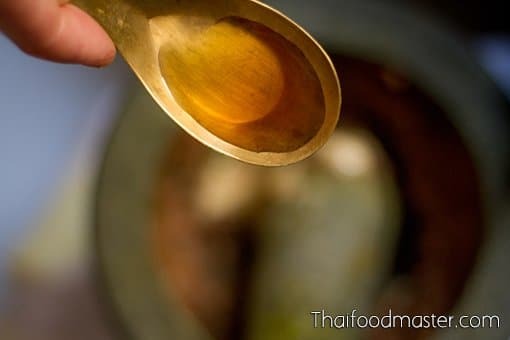 This is probably because, even though naam phrik lohng reuua is based on commoners’ food, it technically falls into the category of Royal Thai cuisine. 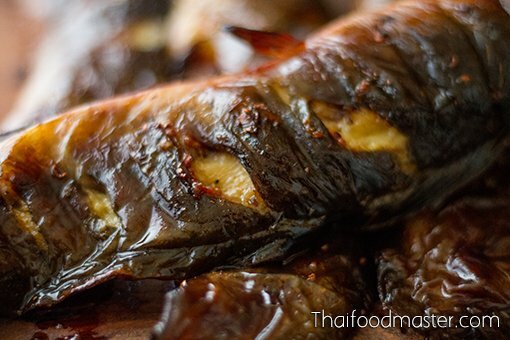 Royal Thai cuisine is renowned for both its delicacy and inventive ingenuity, as well as its extravagant presentation. The court ladies and master chefs of the time crafted sophisticated dishes that are still a feast for both the eye and the palate. 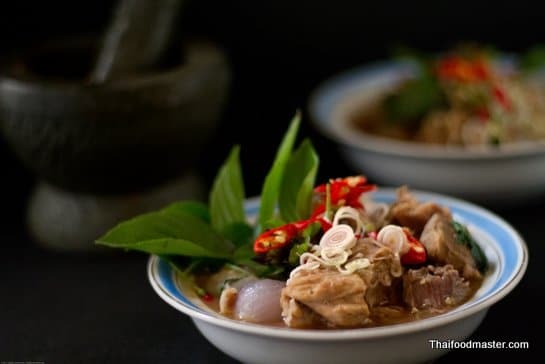 They wisely adopted rural, ethnic, and even foreign recipes, elevating them into luxurious dishes that are authentically Thai. 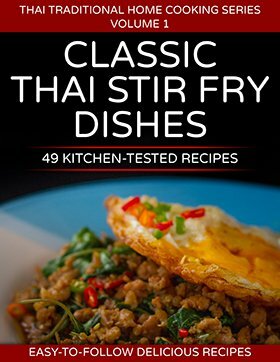 Food researchers and Thai food connoisseurs reading through Old Thai cookbooks and memorial books will find collections of recipes written by the aristocratic ladies of those times and – because central Thailand and particularly Bangkok were a major urban center dominating Siam economically, socially and culturally – those readers might get the impression that the flavors in these recipes are an accurate reflection on what was served in other parts of the Kingdom or the Royal family’s table. However, we have no direct evidence to support this: we believe that, more likely, the place of Grand Palace court food at the top of this hierarchy is a reflection of the writers’ identity and social status. There also exists a misconception that the upper classes in those times did not consume spicy food, and that the dominant seasoning trend was a subtly delicate balance of sweet, salty and sour flavors; from this, we can understand why modern versions of naam phrik lohng reuua tend to be on the sweeter side and merit a grandiose presentation at lavish feasts. 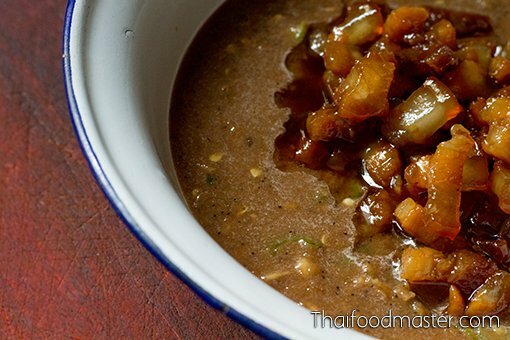 Pea eggplants are often added to fermented shrimp paste chili sauce (nam prhrik kapi), but do not use pea eggplants for nam prhrik kapi if you intend to use it for making naam phrik lohng reuua. 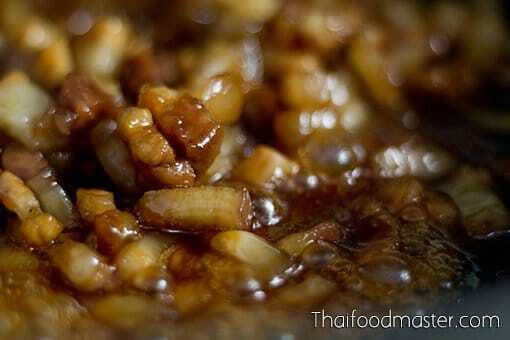 When Thaifoodmaster’s Taan Khun was six or seven years old, his mother took him with her to visit the renowned M.R. Sadap Ladawan, who invented this dish. 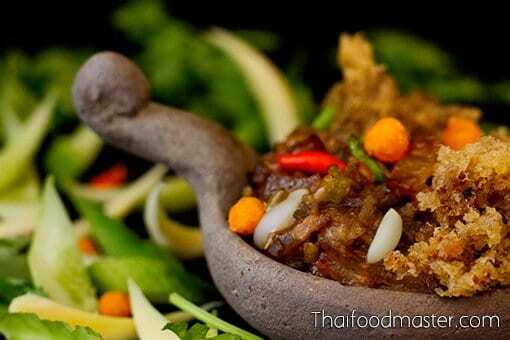 They were informed that adding pea eggplants to naam phrik lohng reuua would darken its color significantly, making the dish look unappetizing. Regarding vegetable carvings: The Queen Consort of King Rama V Savang Vadhana, (สมเด็จพระศรีสวรินทิราบรมราชเทวี พระพันวัสสาอัยยิกาเจ้า) once said “there is no need to dedicate too much time and effort on carving, as most parts of the vegetables will end up wasted”. She recommended that cooks keep it simple. Naam phrik lohng reuua is served as a dip, accompanied by only a few vegetables and all served on one plate. We therefore recommend that you save your efforts, and let the relish itself take the spotlight as the star of the meal, rather than its presentation. 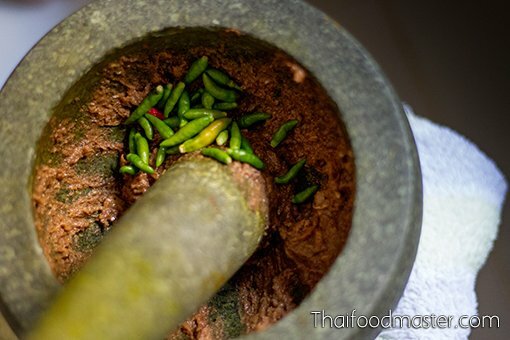 Follow the usual procedure for making fermented shrimp paste chili sauce (nam prhrik kapi). 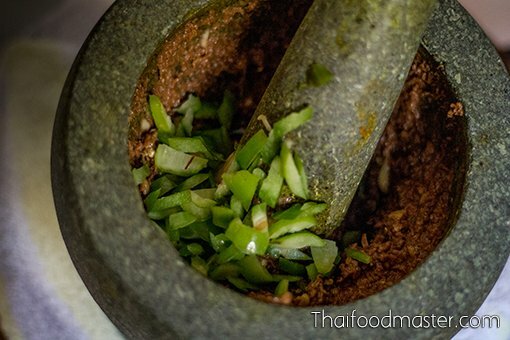 It is recommended that the garlic and the fermented shrimp paste are pounded together first. 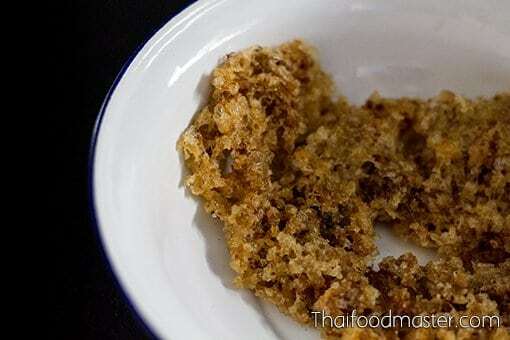 This is known in Thai as khaa gabpi, or “Killing the Kapi” (ฆ่ากะปิ), and will improve the smell, which can be harsh. 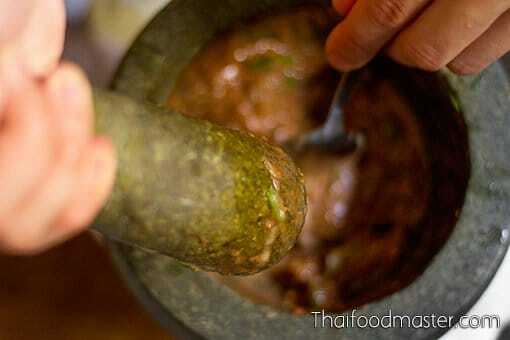 Prepare a fermented shrimp paste chili sauce (nam prhrik kapi) that is slightly runnier than usual. 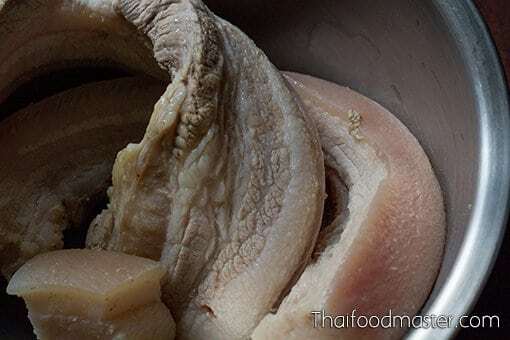 When making the sweet pork condiment (muu waan), you can follow the instructions already posted here but, as we prefer a saltier version for this dish, we have described the procedure again. 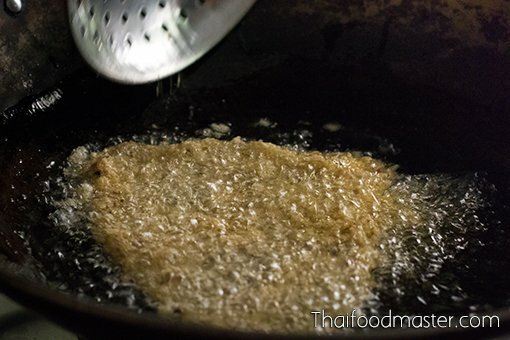 Chill the minced fish meat before deep frying it and the result will be much fluffier and crisper. 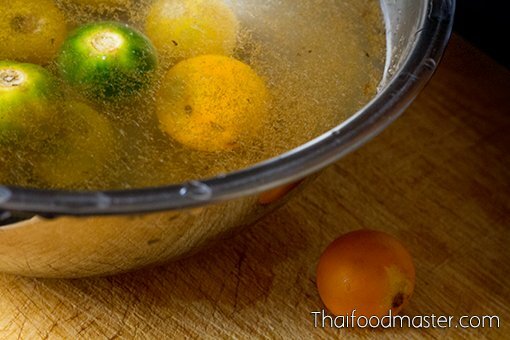 If you have access to either, you should try adding both sour cucumber (madan – มะดัน), and thinly sliced hairy-fruited eggplant (maeuk – มะอึก; solanum ferox). Decide for yourself which version you prefer; we find it to be tastier with these additions. You can also sprinkle fresh green peppercorns, which will add a complementary peppery touch to the dish. Naam phrik lohng reuua is a relish that was created with ordinary ingredients for a real princess. It is made by frying sour-sweet and salty fermented shrimp paste chili sauce (nam prhrik kapi) together with a salty-sweet pork condiment (muu waan), and adding deep-fried crispy and fluffy fish meat for body and crunch. The resulting taste should be sour-salty and sweet, without any of these flavors taking the lead. They should all be equally present, as a melody that plays harmoniously on the palate. apple eggplant, cucumber, winged beans, white turmeric, fresh coriander leaves. 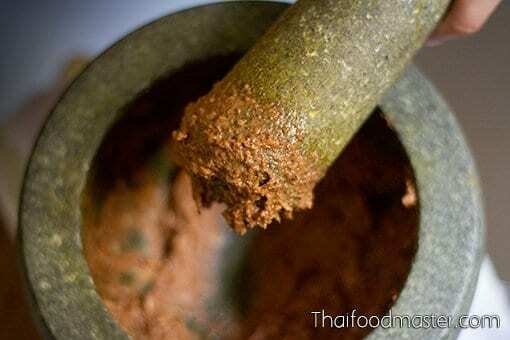 In a pestle and mortar, pound fermented shrimp paste (grilled in banana leaves with garlic) until you get a smooth consistency. Add green bird’s eye chilies and bruise them lightly. Season with palm sugar and fish sauce. The fermented shrimp paste chili sauce is ready, set aside. Cook the pork belly until it is soft; add a pandan leaf to infuse a pleasant scent into the meat. 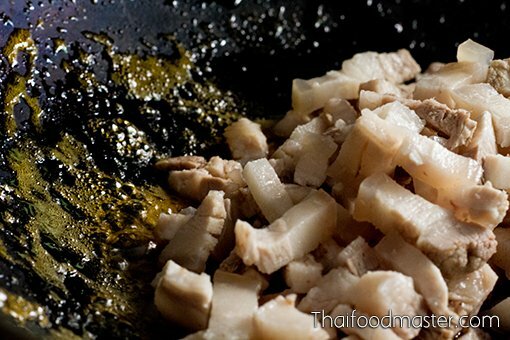 Slice the pork meat into small, uniform pieces. 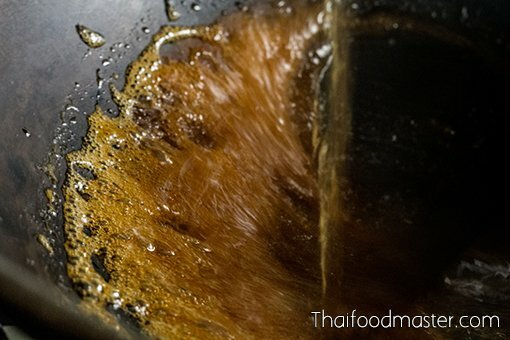 Place the palm sugar in a wok over low heat and stir constantly; the sugar will melt and begin to caramelize. 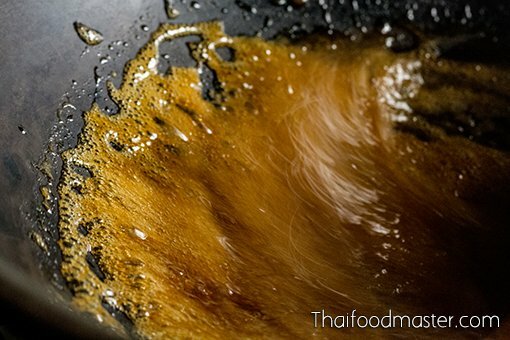 When the sugar has caramelized and turned a deep amber color, add water and fish sauce. Let the sugar dissolve in the liquids, and then add the sliced cooked pork belly. 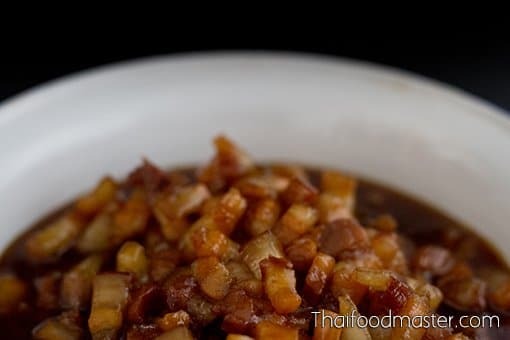 Cook the pork, stirring constantly, until the liquids reduce and the pork acquires a transparent brown shine. Set the sweet pork aside. Charcoal grill a whole catfish over low heat until dry. The process is described here. 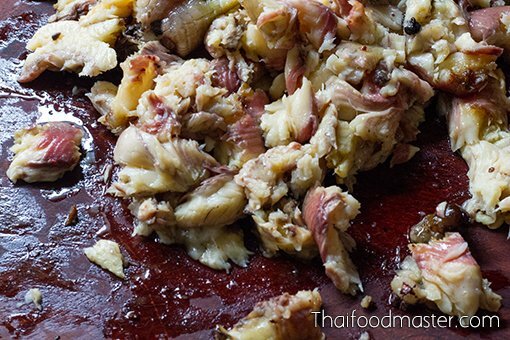 Remove the meat from the fish; discard the skin and bones. With a heavy knife, finely mince the catfish meat. Chill in the fridge for at least 2 hours. 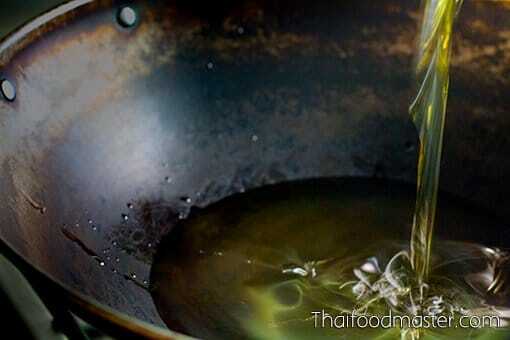 In a wide wok, heat oil for deep frying. 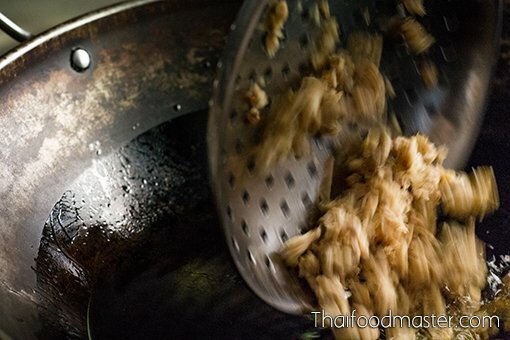 Drop about a half-cup of minced fish meat at a time. Allow the fish to fry until it has formed into the shape of a floating raft. Flip it over, and fry the other side until it is golden and crispy. 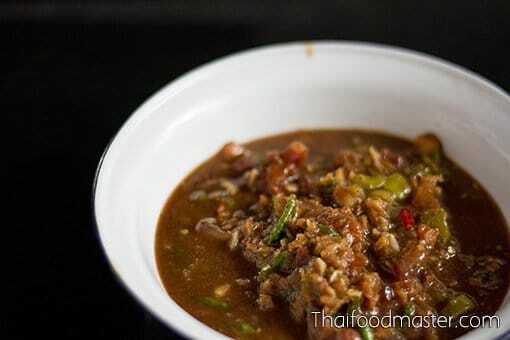 Mix fermented shrimp paste chili sauce and sweet pork. 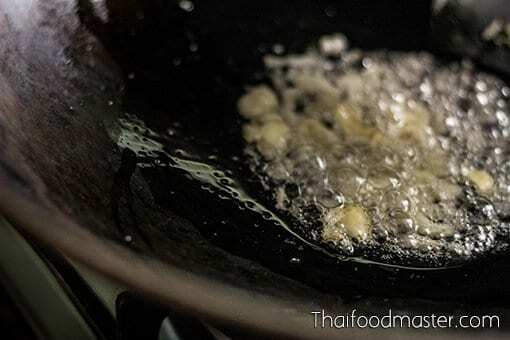 Fry garlic in pork fat until it is fragrant - do not wait until it becomes gold-colored. 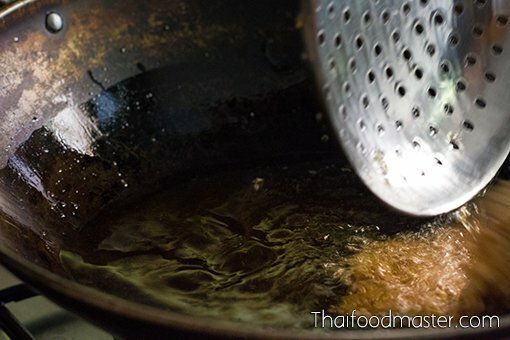 Add the chili sauce and sweet pork mix; continue frying and adjust flavors to taste. 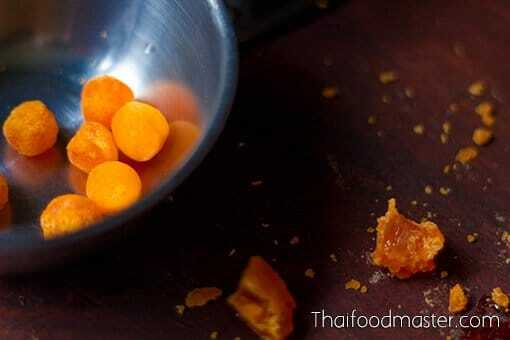 Roll raw salted duck egg yolks into small balls, set aside. 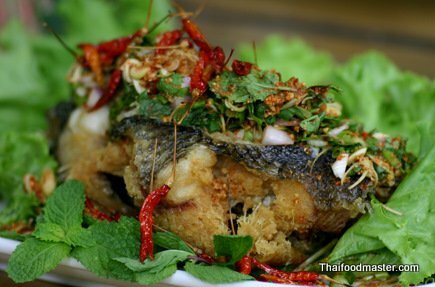 Mix some of the fluffy fish with the fried chili sauce, place it in a serving dish, and sprinkle with crispy fish, as well as yolk balls, pickled garlic cloves and bird’s eye chili peppers. 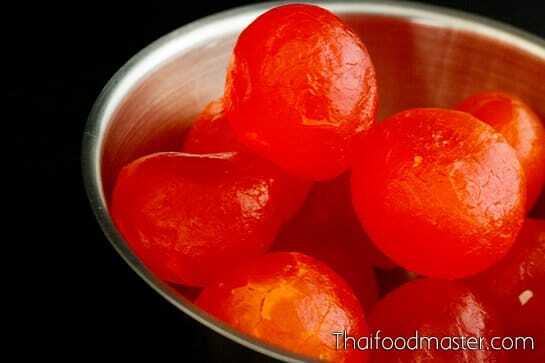 What is a good substitute for madan since this fruit is not available in the States? This dish sounds divine and I would like to try it. Thank you.